Maritime Park in the financial district is a beautiful green space with some innovative environmental design that will intrigue you. 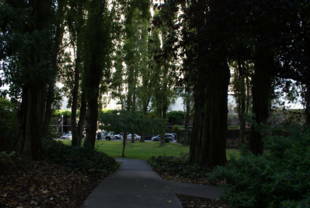 There is a park built on top of the merchant shops on the lower level that is pristine! 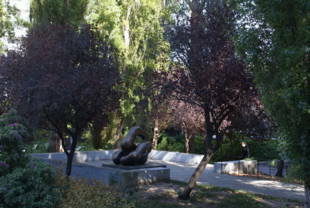 Sculptures are located through out the park as well as benches on which to enjoy your lunch. Some business people who know about this place come here and enjoy the tranquil setting while eating lunch. There is a foot bridge that crosses Davis St. (you can also cross on the street level) that leads you into another part of Maritime Park that has beautiful floral arrangements that catch your eye as you walk by. Maritime Park is owned by the San Francisco Recreation and Park Department. 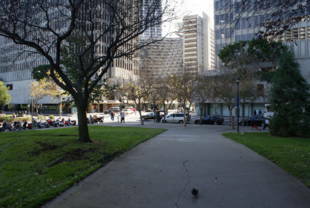 J/K/L/M/N/T rail/subway lines - exit at Embarcadero, walk north on Drumm from Market Street; park is at Clay and Drumm. 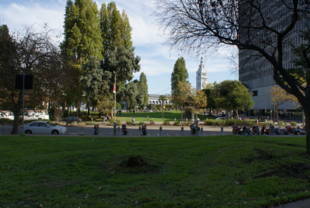 The 1-California bus line stop at the park. One Maritime Plaza is an office tower located in San Francisco's Financial District near the Embarcadero Center towers on Clay and Front Streets. The building, completed in 1964, stands 121 m (398 feet) and has 27 floors of office space. This is one of the earliest buildings to use seismic bracing in the form of external trusses and X-braces. Washington St. & Battery St.